The WX9 is a close mate to the WX10, although it takes a step down in a couple parts of the feature set. 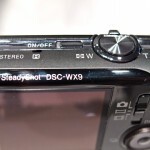 Check out my first impressions of the WX9 below. On the outside, it is immediately apparent that the WX9 is missing the mode dial that I liked so much about the WX10. 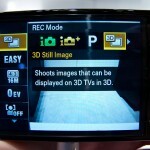 However, there is a dedicated switch for changing between photo, video and panoramic modes. 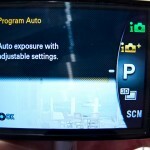 The major control component for the WX9 is the big wheel on the right side of the LCD screen. 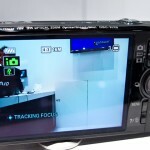 Those of you familiar with Sony’s NEX-3 and NEX-5 cameras will recognize that this is a very close replication to that control scheme. I never became fully accustomed to the controls of any of the NEX cameras I’ve used; however, I did develop a better sense of using the control wheel over time. 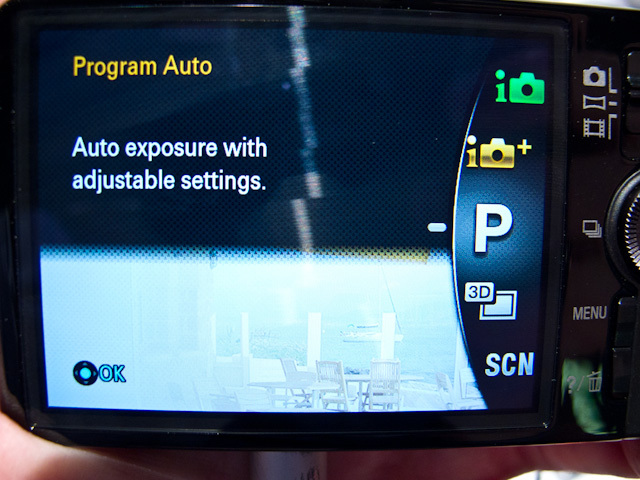 For those unfamilar with Sony’s NEX cameras, the wheel serves as a sort of faux mode dial. Rotate the wheel and it brings what looks like a traditional mode dial graphic on the camera’s LCD. As you rotate it further, so does the on-screen dial. While it keeps the camera’s case rather clean, I have a feeling that I need to go “in the map” when I use it. Somehow, using this control wheel is both convenient and inconvenient at the same time. That said, the exterior and graphical design of the WX9 is very slick. The LCD is a high resolution 920k-dot panel, which looks great. 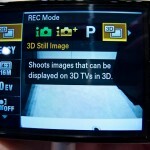 Sony puts on some very shiny visuals as you navigate the camera’s menus. And, I’ll be the first to admit that the control wheel-based “mode menu” just feels better on this camera than the NEX models. 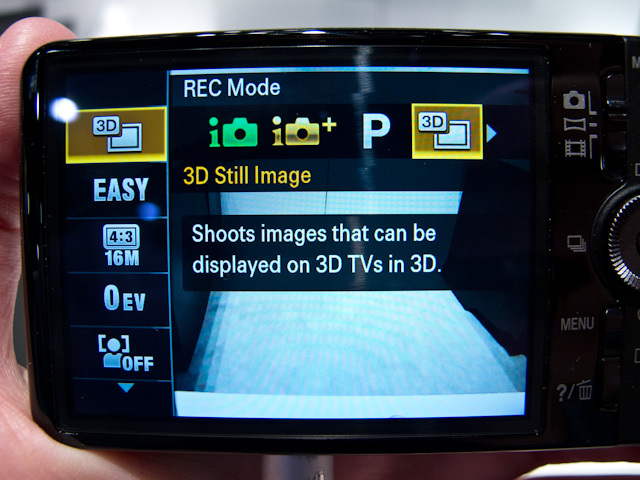 Rounding out the controls on the rear of the camera is a convenient direct-record button for instantaneously capturing AVCHD video – without the need to jump into other menus. 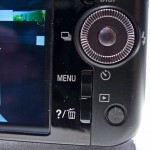 An oddly-positioned “Menu” button is found below the control wheel, and it allows access to deeper controls in the camera than you get from the customary functions in the mode menu system. 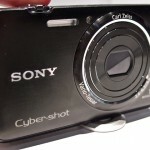 Like the other 2011 Sony Cyber-shot models, the WX9 has a very responsive zoom and shutter, along with quick autofocus. However, the WX9 does not have the speedier coil AF system found in the WX10. Frankly though, I did not notice any discernible difference between the cameras while snapping photos with them side-by-side. 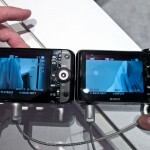 In terms of image and video quality, the WX9 should stack up nicely with the WX10 and HX7V. 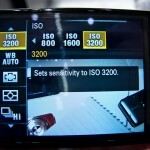 The WX9 covers a sensitivity range of ISO 100-3200. While I was not permitted to retain any images from the pre-production WX9, I managed to grab a few images with the HX7V, which should give an idea of what kind of performance you can expect out of the similarly-equipped processor and sensor in the WX9. 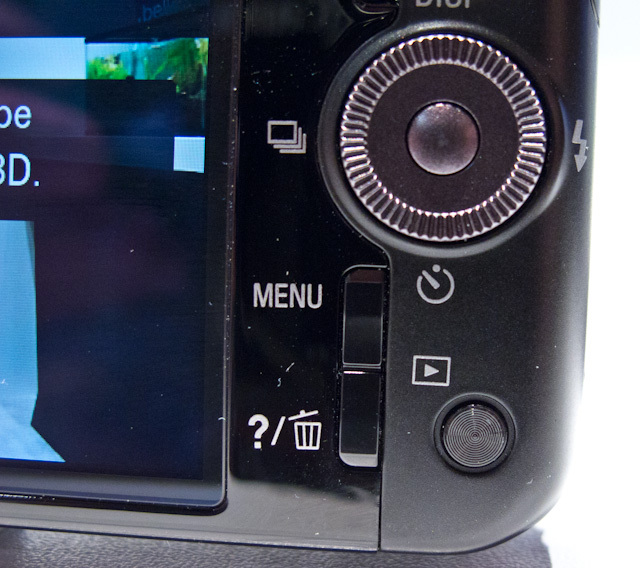 You can see those images in the HX7V hands-on review. 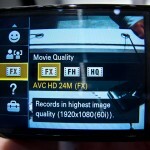 Likewise, the WX9 captures full 1920 x 1080 video at 60i in AVCHD – with a max bit rate of 24Mbps. 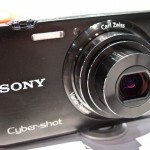 I’ve been very pleased with past Cyber-shot cameras’ HD video offerings, and this new batch of Cyber-shots looks to be even more impressive on initial inspection. Those concerned about the interlaced video codec should be comforted by the fact that it imports to common video editing software as 30p footage. 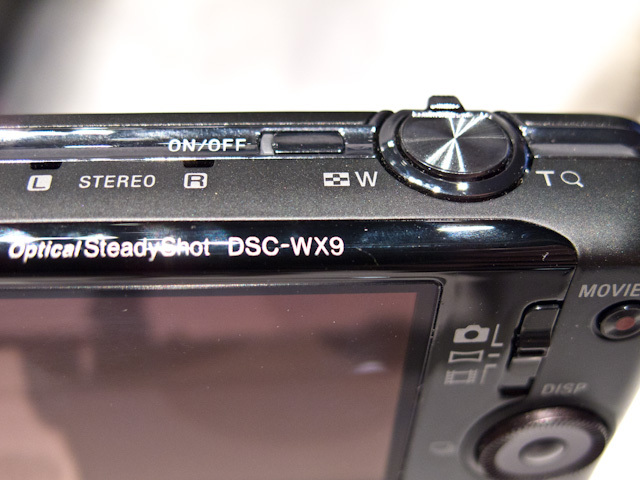 Additionally, the WX9 captures stereo sound to accompany the great HD footage. My first impressions of the WX9 are good ones, although I remain a little apprehensive about the control dial. The control scheme wouldn’t be a deal killer for me if I were limited to the $220 asking price. 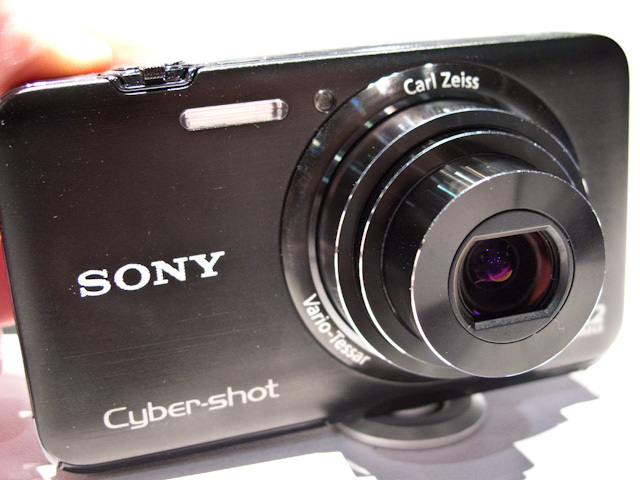 Stretch a little further closer to the $300 mark and you could pick up the excellent Sony Cyber-shot HX7V (which offers double the zoom range and a proper mode dial). Those looking for a budget shooter in the $150-or-so range would do well to save a few more pennies and go with the WX9 (or pick one up on sales that are sure to come as vacation season approaches). 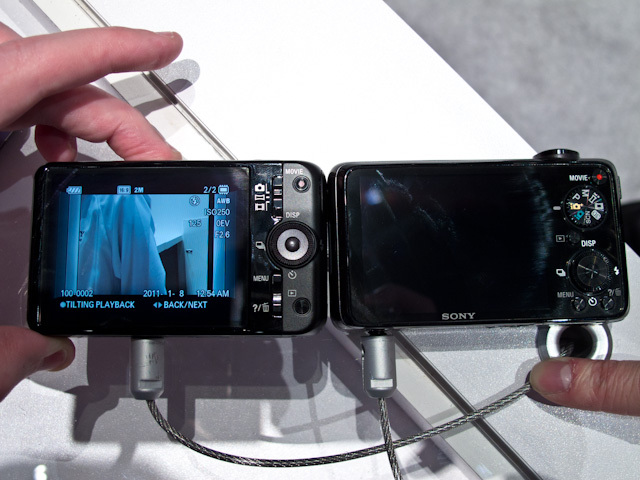 I personally prefer this one over the TX series cameras. 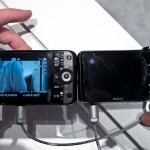 It seems like there isn’t much difference except for the touchscreen interface, which isn’t a must for me. 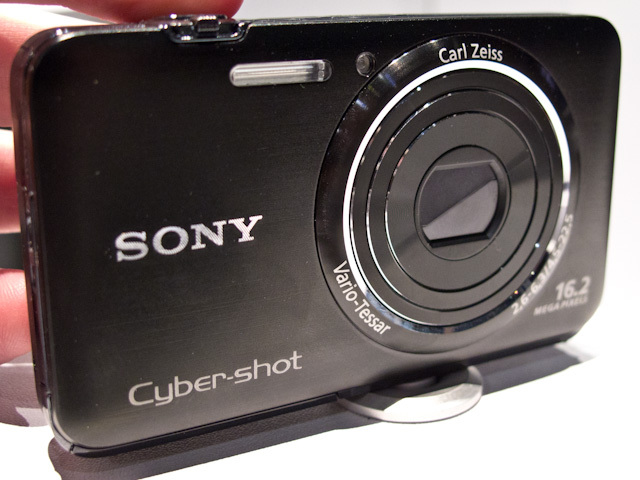 Plus it’s got a better optical zoom.